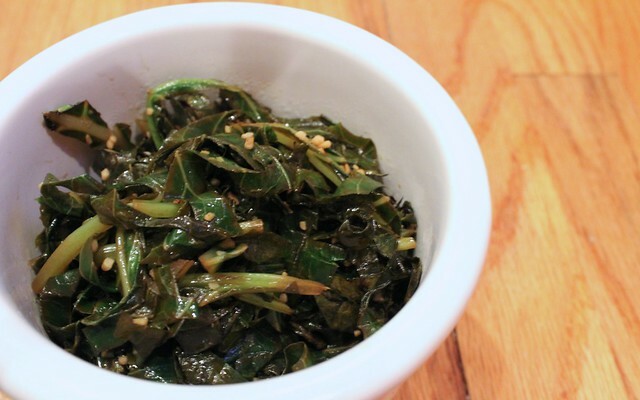 This year I brought back some collard greens, and I’m thrilled to share this delicious recipe with you. It’s actually become my go-to recipe for collards because of how easy it is and how great it tastes. After learning this traditional Brazilian recipe for collard greens, I started playing around with it by occasionally adding different spices or flavorings. The best I’ve had, though, is with some added lemon juice and zest. And that’s how I’m serving up these Brazilian garlicky collard greens (a.k.a. couve a mineira). The first thing you need to know about Brazilian-style collard greens is that they need to be chopped into strips, like the ones you see above. How I do this is that I gather 2-3 leaves together, one on top of the other, and then roll them up the way you would a burrito. Then, you just cut them into 1-inch strips and you’re done. Don’t they look great? Cutting them into these small strips makes it easier to cook, and also cuts down on the cooking time. On average, it takes about 20 minutes to cook the collards all the way through so that they’re soft and no longer bitter. 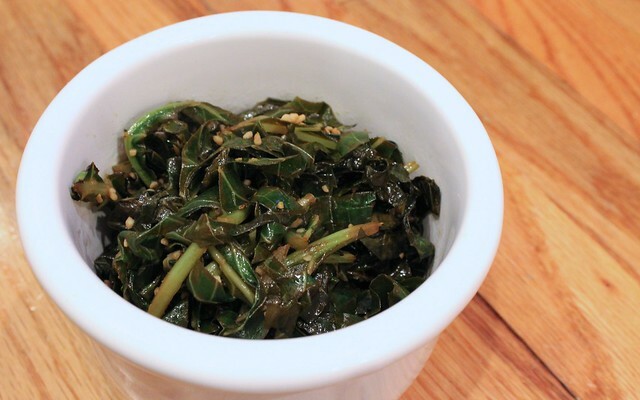 I typically love to serve up these garlicky collard greens with some sautéed fish and quinoa. But you can really do anything with these. It’s such a versatile vegetable and this dish is so simple. You can do it with chicken, meat, anything really. Try it! It’s really good. The traditional Brazilian recipe for collard greens includes plenty of garlic and is the perfect healthy side-dish to any meal. First, zest the lemon and then juice it. 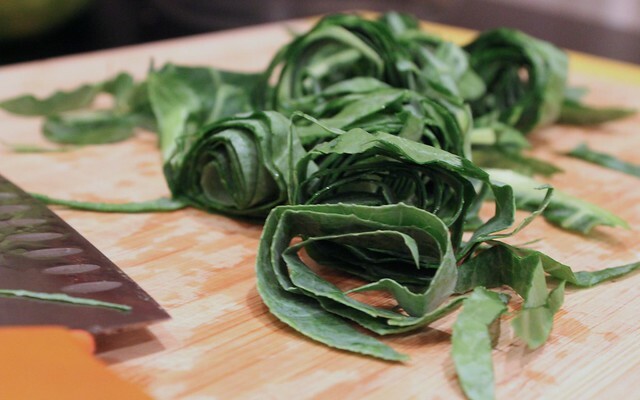 Roll 2-3 leaves of collard greens, then cut them into 1-inch strips. In a large pan, heat the olive oil and begin adding the collard greens. Keep adding the greens and cook, about 10 minutes. Add in the minced garlic, lemon juice and zest. Continue cooking until the collards are well-done, about 10 more minutes. Finally, serve ½ cup to each person. And enjoy! 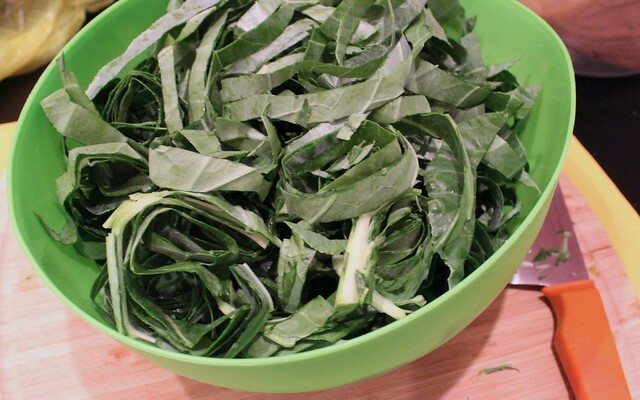 How do you like to make your collard greens? This entry was posted in Brazilian, Gluten-Free, Vegan, Vegetables, Vegetarian and tagged Brazilian, collard greens, garlic, vegetables by Irina Gonzalez. Bookmark the permalink.